CPT construction and architectural composite panels allow architects and designers creative freedom in their designs. Architectural Composite panels provide longer, flatter, and stronger panels than traditional building methods. 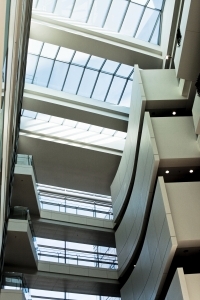 Panels can be designed to have high impact and flexural strength to meet the demands of industry. CPT architectural composite panels are commonly used for signage, facades, hurricane protection screens, curtain walls, cladding and soffits. Additionally, construction composite panels systems can be used as walls, floors, ceilings and doors to create entire structures that are lightweight, durable, and strong. CPT panels are custom designed for your application and budget and will meet the most demanding requirements in the construction market. CPT panels can be supplied in raw sheet form, cut for profiles and sizes, or fitted with edge trimming to make them a finished assembly. 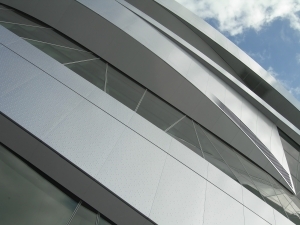 Our panels can be designed to provide structural strength or high insulation value. Our highly experienced sales and engineering teams can assist you in choosing the best composite panel or panel system to meet your requirements.